3rd Annual Canine Carnival Announced! Canine Carnival 2012 is on the way with even more animals and fun things to do including a live concert. The date is Saturday August 4th 10am ‚Äì 4pm at a new location, Longbranch Park in Liverpool. Proceeds from the Canine Carnival go to the Priscilla Mahar Animal Welfare Foundation (a non-profit foundation named after my Mom, Wayne Mahar‚Äôs Mom, who passed away five years ago and loved animals). 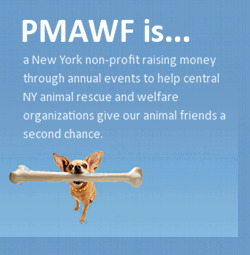 To date, PMAWF has donated nearly $30,000 to animal welfares and rescues in central NY. Thanks to our great sponsors Wegmans, Liverpool Village Animal Hospital, CNYcentral and Veterinary Medical Center of CNY. This entry was posted on Thursday, May 3rd, 2012 at 11:45 pm	and is filed under Uncategorized. You can follow any responses to this entry through the RSS 2.0 feed. Responses are currently closed, but you can trackback from your own site.